A Science of Impurity "d0e2594"
As more and more chemists came to admit that whatever it was that poisoned water was beyond their ability to measure, the issues of interpretation and advising became increasingly important. To those like Brande who claimed to know the characteristics of bad water, the recommendations one made were straightforward. The sort of transitory and inaccessible morbid poison Hofmann, Way, and Rawlinson envisioned raised more troublesome ethical questions. One might well, as had Hofmann and Blyth, recognize in a water nothing actively dangerous yet judge it unsafe. Such a judgement might be made independently of chemistry, simply from knowledge of the sorts of pollutants upstream towns dumped into a river. The problem was what one should say about that danger and how one should say it. of outrage-and-disgust approach taken by Hassall, was equally unworkable. However worked up one might manage to get at being sold sewage-polluted water, it was impossible to escape the ambivalence and ambiguity of the verdict supplied by the best contemporary science, which was that impurities were usually purified, and that the water apparently caused little serious harm. In the cases of both of these alternatives, analysts were adopting a stance toward policy-making in which expert and layman were essentially on an equal footing. Hofmann and Blyth were willing to let the facts speak for themselves, making only the one major qualification that the particular facts they could offer failed to address the most important questions. Hassall, too, was calling attention to the facts of water supply, albeit by means of the most vivid language he could find. With the facts, the Members of Parliament and of the London vestries would presumably make wise choices. Yet from the reformers' point of view, they were not doing so. politically untimely and maladroit, they had an excuse not available to other public servants: they spoke, they claimed, the truth of science, and science would not be held hostage to political convenience. The ideal of neutrality and the claims of expertise carried sufficient political power that each had a long run. Of the three Frankland was probably the most successful in having a direct effect on change, if only because he concentrated on the narrower area of water policy. So long as water quality was not at the centre of public attention and so long as statements like those made by Brodie, Rawlinson, and Way were expressed as abstract ideals or arose only in peripheral policy issues, they could be disregarded. But as nihilism became more systematic, coherent, consistent, and institutionalized, it became impossible to ignore, and that began to happen in 1866. Beginning in the early '60s there had been renewed stirrings about the possibility of a new water supply for London. Along with the old plans for obtaining purer water from nearby sources were several more ambitious schemes for systems of conduits linking London with some distant watershed, even one as far away as the Lake District or the Welsh hills. Liverpool, Glasgow, Manchester, and Dublin had each utilized the technology of long distance water transport to obtain copious soft water, and there seemed no reason why the approach would not work for London, even though the conduits would have to be substantially longer. These schemes seemed unlikely to be objectionable on grounds of insufficient quantity of water, the principal objection to the alternatives considered in 1850–52. that of the Royal Commission on Water Supply which sat from early 1867 to early 1869. Edward Frankland had only just become involved with the London water supply when the commotion began. In June 1865 he had been appointed official analyst of the London water supply by the Registrar General of Births, Deaths, and Marriages. Since 1857 the holder of the post had provided a monthly report to the Registrar General on the composition of the water supplied by the London companies, and frequently also on the composition of the water supplies in a few other large British cities. R Dundas Thomson, chemist and medical officer of St Marylebone, had been the first occupant of the position, holding it from October 1857 until shortly before his death in August 1864. In February 1865 Hofmann had taken over the analyses, but had soon quit to return to Germany. When Frankland succeeded Hofmann as professor of chemistry at the Royal School of Mines (which had absorbed the College of Chemistry), he also took on the post of water analyst. As a youth in Lancashire, Frankland had practiced chemistry as a hobby and been apprenticed to a pharmacist. Through local connections he had been sent in 1845 to Putney to study more advanced chemistry with Lyon Playfair and had gone from there to work in the laboratory of Robert Bunsen in Marburg and briefly with Liebig at Giessen. In 1851 Frankland became the first chemistry professor at Owens College, Manchester, having already established a solid research reputation through investigations of organometallic compounds. In 1857 he left Manchester to become chemistry professor at St Bartholomew's Hospital. He also held one of the chemistry professorships at the Royal Institution from 1863 to 1868, but spent most of his career (1865–85) as the professor of chemistry at the School of Mines, the most prestigious of London's chemistry professorships. sanction (as Frankland's critics would sometimes point out), and hence it was not quite correct to think of its occupant as the 'official' analyst, but the government did pay the analyst for his services. It is hard not to sympathize with Burnell. By listing the constituents of distilled water, Thomson appeared to be suggesting that the London supplies were impure to the degree they differed from that standard. It is likely that Thomson knew exactly what effect he was trying to achieve, that his format was meant to remind Londoners that what they drank was less pure than it might be. Certainly Farr, Thomson's superior, shared with many sanitarians a sophisticated appreciation of the rhetorical utility of statistics. For them statistical presentations were not neutral; they were an opportunity to juxtapose facts in such a way as to highlight problems or reveal solutions. (from Miller, 'Analysis of Potable Waters,' 1865). loss as well) was understood to correspond to the putrescibility and hence the insalubrity of the water. Although great hopes had been held out for it at the outset, the permanganate process was objected to for a number of reasons: most importantly, there was some doubt whether it allowed a sufficiently precise distinction between harmful and innocuous organic matter; some held that the test was popular only owing to the vivid colour reaction (when the bright pink fluid ceased to lose its colour, all the readily oxidizable material was gone). There was also recognition that the oxygen in the permanganate might be lost to inorganic compounds, such as nitrites. Moreover the variety of versions of the test led to problems. As one chemist complained, 'solutions so different in strength are used, and there are such diverse ways of employing them, that it is difficult . . . to institute any comparisons between the results arrived at. Frankland's use of the process shows that he, like most chemists, was mainly concerned with putrefaction. According to this standard, London's water was normally safe since the most putrescible materials were also those quickest to decompose, leaving the water pure. Chemical analysis . . . does not reveal any exceptional degree of pollution in this water. It must be borne in mind, however, that chemical investigation is utterly unable to detect the presence of choleric poison amongst the organic impurities in water, and there can be no doubt that this poison may be present in quantity fatal to the consumer, though far too minute to be detected by the most delicate chemical research. and Snow he was also thinking in terms of a specific morbid poison transmitted in a particular medium, and while it might be true that catching the disease was a consequence of many causes, that did not detract from recognizing water as the main means of its spread. His call for treating water with potassium permanganate, a disinfectant as well as a reagent, shows that like Hofmann, he believed the cholera poison to be a unique mode of putrefaction. But Frankland was changing his views. By the end of August he had lost confidence in permanganate disinfection and even in filtration through animal charcoal. These helped, yet could not be counted on to purify water, and even boiling might not work. In November he presented evidence that the cholera poison was likely never to be detectable through chemical means: he had obtained a sample of the 'rice-water' evacuations of a cholera victim, diluted it with 500 parts distilled water, and filtered the mixture. Upon analysis, the still turbid mixture absorbed 0.04 parts/100,000 oxygen from permanganate, while normal Thames water took 0.07 parts. At a ratio of only 1 part cholera evacuations to 1000 parts water—far more concentrated than would usually be the case—cholera evacuations would be analytically undetectable, yet nevertheless deadly. Though Frankland eventually demonstrated that human error had been responsible for setting off the east London epidemic—company technicians had improperly put into service a reservoir contaminated with water from the polluted lower Lea—the epidemic had been fundamentally a consequence of reliance on polluted water, and in the next few months Frankland took up the problem of water analysis. In a Royal Institution lecture in late March 1867 he reviewed the two leading processes for measuring organic matter in water, the ignition and permanganate processes, and found them unacceptable. His criticisms were not new, but Frankland put them more forcefully than others had. He was in a position to do so for he was perfecting a new method along the lines suggested by Hofmann and Blyth in 1856. He faced the same problem they had faced, of focusing on organic nitrogen but of having no way to measure it directly, and he took up Hofmann's solution of determining organic nitrogen as the difference between the 'total combined nitrogen' and the sum of the inorganic forms—nitrates, nitrites, and ammonia. Frankland had little to say about this organic nitrogen, however. He devoted more attention to the inorganic nitrogen compounds, from which he calculated the 'previous sewage contamination' (PSC) of the water. One made the calculation by multiplying the total inorganic nitrogen in parts per 100,000 less 0.032 (a correction for rain-water nitrogen) by 10,000 (the dilution factor of average London sewage). Ostensibly the result indicated the amount of sewage which would have had to have been in the water to produce upon decomposition the inorganic nitrogen actually found in the water. This calculation would be the centrepiece of Frankland's format for presenting analytical results until 1876 when it was quietly dropped. It was the source of confusion and occasioned much criticism, and it is well to ask why Frankland developed it. Even as he presented the term Frankland recognized that it was a misnomer. He admitted that all nitrogen compounds in water did not come from sewage or even from animal wastes, but maintained (at least in 1867) that 'animal or vegetable, no distinction founded upon this can be drawn between their respective noxious qualities.' In the next few years he went to great lengths trying to establish that whenever nitrates were found in a water they could be traced to an animal source. remind the public of the danger of a sewage-contaminated water supply. Initially it would compensate for his failure to find the 'actual sewage contamination' (organic nitrogen) that would provide grounds for condemning the water. Its quantity was presumably so small as to be masked by the error that arose in the separate determination of inorganic forms of nitrogen. With the launching of PSC in early 1867 Frankland had begun to integrate analytical processes with formats for presenting results. He was developing a strategy to make analysis a basis for social action. The strategy embodied the following principles: 1) that both negative and positive results of water analysis were untrustworthy (analytical nihilism); 2) that the onset of water-borne zymotic disease was unpredictable; 3) that decision-making bodies, having great and misplaced faith in the abilities of chemistry, would not take decisive action in the face of uncertainty; 4) that therefore, in attempting to protect the public, the scientist could not rely on normal democratic processes, but would have to pre-digest information. Frankland by no means founded this practice of colouring facts in this way. Hassall, who was openly glad to see that Frankland's analyses were 'calculated to alarm the public mind,' had done something similar. But he did raise substantially the level of insidiousness, and it became necessary for analysts representing other interests to respond with similar tactics. Neither felt a need to take a stand on whether the poison was obscure fermentation or belligerent cell; that is whether, from the modern viewpoint, the Liebig or the Pasteur model was the more accurate. There was no good way of choosing between these hypotheses, no consensus that the dichotomy was a real one, and in many respects it seemed not to matter. The Cattle Plague Commissioners had made it clear that the term 'germ' was to be used metaphorically, to represent a set of characteristics rather than an entity: 'the terms "germ," or "growth" are used because no better expressions can be found,' they wrote. 'They seem to imply an independent living existence of the poison, and on this point our knowledge is not yet sufficiently definite. Care must be taken that the terms used do not lead to erroneous conclusions.' Indeed, throughout the '60s and '70s the term 'germ' was an extraordinarily vague one; as J L W Thudichum pointed out as late as 1878, germs were eggs for some, seeds for others, 'shapeless ferments' for still others. The scheme of water analysis Frankland announced in the spring of 1867 could be justified alternatively in terms of germs or putrefying matter. Focusing on organic nitrogen made sense in terms of the zymotic theory since only nitrogenous organic molecules could acquire a dangerous form of putrefaction, but it also made sense in terms of a germ theory, since many felt that germs would require a congenial home of nitrogenous organic matter in which to 'vivify and develop' whilst in between human hosts. In the next two years, however, Frankland did begin to recognize that living germs and putrefying matter differed in some important respects, and while for many years he would maintain that the identity of the agents of water-borne disease was not yet known, his analytical approach came increasingly to reflect the belief that living germs were morbid poisons. combustion process for direct measurement of organic carbon and nitrogen in water developed by Frankland and his student H E Armstrong. Their process was a modification of the procedure normally used to determine the proportions of the elements in organic matter. In it the sample was slowly evaporated with sulphurous acid, a mild reducing agent, which would destroy nitrites, nitrates, carbonic acid, and carbonates, leaving a residue in which any remaining carbon and nitrogen could be assumed to represent organic matter. The residue was then placed in a combustion tube in the presence of lead chromate, an oxidizing agent, and heated to combustion. From the combustion gases the analyst could compute the quantities of organic carbon and nitrogen, with the determination of organic nitrogen needing to be corrected only for ammonia. Though simple in principle, the process demanded exceptional skill from the analyst, took two days to complete, and required equipment and facilities beyond what many analysts possessed. used it (J Chem Soc 6 (1868): 90). Yet the revolutionary character of Frankland's analytical system lay less in new processes than in new principles, especially those for interpreting results. The combustion process was not to be simply another, if better, means for measuring the organic matter in a water. Indeed, analysis was no longer to be concerned with the actual discovery of water-borne poisons at all, nor even with the identification of indicators, the constant companions of those poisons. Instead it was to be the means of discovering a water's history of contact with dangerous pollutions. Previous Sewage Contamination, organic nitrogen, and particularly the ratio of organic nitrogen to organic carbon, were to be the indelible marks of that association. to-be-decomposed organic substances in the water. By early 1868 Frankland had decided that it was important whether this organic nitrogen was of animal or vegetable origin for the agents of disease were likely to be associated only with animal contamination. He believed that each class of contamination would produce a characteristic nitrogen:carbon ratio, and, in general, that the worst contaminations, sewage for example, would show the greatest proportion of nitrogen. Hence this ratio might be more important than the actual quantity of organic matter present. In practice Frankland only considered the N:C ratio in questionable cases; with regard to London's water, known to be contaminated with sewage, he habitually treated all organic nitrogen as actual sewage contamination and ignored the accompanying carbon. Here too, however, Frankland was not claiming that organic nitrogen was harmful, or even that water having a particular N:C ratio indicated that harmful matter had contaminated the water. It showed only that the water had at some time past been contaminated with dangerous matter that might become actively harmful at any time. Frankland's designation of a water's history as the primary concern of the analyst may seem obvious to modern readers. If we want to know whether there is anything bad in the water it may seem common sense to ask where it has come from and what kinds of things are likely to have gotten into it. In fact, Frankland's move was not at all obvious, but required the linking of two discrete traditions, the indicator approach of the 1850s and the concept of contingent contagionism. with finding the remains of substances that might have entered the water in the company of the dangerous matter. Increasingly, this would become the significance of the organic nitrogen measurement; it was a component of potentially germ-bearing sewage. Similarly, nitrates, nitrites, and ammonia would become important because they showed water had once been polluted and might still bear living germs. Thus no longer were indicators contemporaneous with the harmful substance; now they were to be regarded as fossil records of a dangerous event. if you were to break an egg and beat up the contents, and mix them with Thames water at oxford, the organic matter so introduced into the Thames . . . probably would be entirely destroyed and converted into mineral matter before it reached Teddington [near the companies' intakes]; but if you were to throw an egg in without being broken, it would be carried down by the stream and would reach Teddington with its vitality undestroyed. The reason the public could find no security in filtration was that germs might be so small as to pass through filters: 'I should not be prepared to say that after any amount of filtration we should be guaranteed from the presence of those minute germs, which being smaller in some cases . . . than blood globules, would pass through the pores of the chalk . . . like human beings pass through the streets of London.' These examples illustrate the use Frankland was making of the germ concept. It offered an argument that was irrefutable because germs were hypothetical; it was sufficiently vague to be adapted to a wide range of rhetorical requirements, yet concrete enough to convey a vivid image—of a poison resisting the elements, of a poison able to slip between the pores of a filter. For Frankland, the germ was more a symbol than a theory. It symbolized several characteristics of water-borne zymotic disease: the unpredictability of outbreaks yet the constant links to sewage pollution, the undetectability of the poison and its ability sometimes to resist the effects of dilution and oxidation, and the ability of the poison to increase itself in a suitable environment. It was not necessary to insist that these characteristics must inhere in some entity, though it was certainly convenient. I consider that water contaminated with sewage contains that which is noxious to human health. There is no process practicable upon a large scale by which that noxious material can be removed from water once so contaminated, and therefore I am of opinion that water which has once been contaminated by sewage or manure matter is thenceforth unsuitable for domestic use. The dogma was clear, but did Frankland really mean it? The commissioners assumed he did not; that despite his strong statement, Frankland must, like any other chemist, use his analyses to determine whether a water was safe. Time after time Frankland made it clear that he rejected that conventional assumption. He blithely agreed that the nitrates he measured in London's waters (the main ingredient in the previous sewage calculation) were harmless. The Duke of Richmond took that response to mean that the water was good—if Frankland, a chemist, agreed that 'there is nothing in them [nitrates] that could be injurious to health, . . . therefore the water is a wholesome water to drink?' 'I did not intend my statement to go so far as that,' Frankland replied. Nitrates might signal the presence of something dangerous. done according to the format that the water companies found objectionable. Companies , p 49, 1872). and that whatever lowered PSC could be assumed to be making water safer. He even developed a scheme for classifying potable waters based mainly on previous sewage contamination. He supported measures to make Thames and Lea water safer, and saw great room for improvement in filtration since the filters of some of the companies did a better job purifying the same water than those of others. Sewage treatment by upstream towns would help too. But while all these might improve the water, none of them changed the fact that London relied on sewage-polluted water, and that such water was inherently unsafe. What so exasperated the commissioners was that Frankland was advocating an approach to water analysis wholly incompatible with the practice of his colleagues, even those who admitted that morbid poisons were beyond the reach of analytical chemistry. The commissioners expected chemists to base their advice on the results of their analyses. Hitherto chemists had believed that even though they might not be able to isolate the causes of water-borne disease they could offer useful approximations based on the measurement of indicators. Frankland rejected even this limited assumption. Water with a bad history was to be allowed no redemption, no matter how pure it might appear. Eventually Frankland would liberate the concept of impurity from all analytical constraints. The Appendix demonstrates how, as he became familiar with the analytical characteristics of different kinds of lake, river, spring, and well waters, he modified his interpretive framework in such a way that any set of results could lead to the conclusion either that the water was safe or polluted, depending on what was independently known of its history of contamination. health of the water under examination. Indeed the power of chemistry seemed to stem directly from the chemist's ability to discover such secrets. an abuse of chemistry, that a chemist . . . should state and summarise the results of his analyses in such a fashion as to make it appear that the unwholesomeness, which he really infers on other grounds, is strictly deducible from the results of his periodical chemical examinations. To those with conventional notions of the role of chemical analysis, Odling's complaint was well founded. It is easy to get the impression from Frankland's reports that chemical analyses were the sole basis for his judgments of water quality, particularly if that is what one expects from a chemist and if one only reads one of the brief monthly reports. 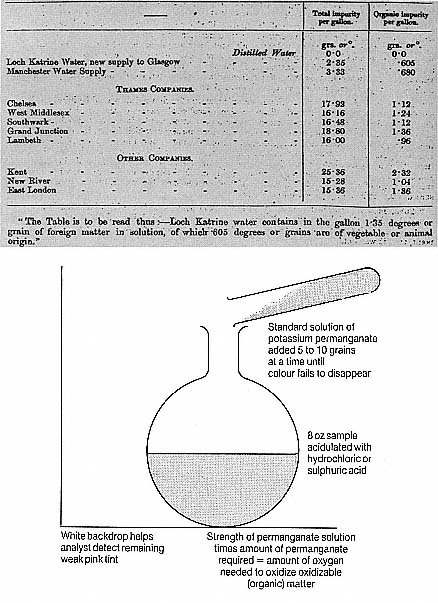 In fact Frankland had recognized that potable water analysis presented a different kind of problem from many other problems of practical analytical chemistry, such as the evaluation of fertilizer, mineral ores, or foodstuffs alleged to be adulterated. In such cases there was reason to believe that statements made as to the purity or value of the material might be untruthful; the analyst was to validate or reveal the falsity of those statements. But such was not the case with potable waters. The circumstances of their origin were unavoidably public. There were cases in which clients concocted water samples to deceive analysts, but only a few. Hence in coming to a judgment on the quality of a water there was no reason not to take into account all the information one could assemble including descriptions of the circumstances of the site from which the water had been taken and details of its apparent effects on those who drank it. a central tenet of an analytical protocol developed by the Society of Public Analysts in the early 1880s. During the years that Frankland was developing his radical views on water quality he was also gaining prominence as a sanitary scientist. In spring 1867 he was still not a specialist in water analysis. A year later he was rapidly becoming Britain's leading authority on water quality. It is not clear that Frankland meant this to happen though he did make the most of two fortuitous opportunities. These were the establishment of the Royal Commission on Water Supply in early 1867 (Frankland was appointed one of its consulting chemists) and the collapse and subsequent re-establishment of the Royal Commission on Rivers Pollution, with Frankland as one of the new commissioners. The main task of the Water Supply Commission was the evaluation of the schemes put forward as alternative sources of supply for London. To assess the quality of the various alternatives, it chose Frankland and William Odling, his successor at St Bart's and colleague at the Royal Institution. They submitted three reports, one on the waters from Cumberland and Wales (November 1867) and two others on the Thames (July and September 1868). In two of these substantial portions appeared under Frankland's name alone—his views on water quality had already become too extreme even for a sympathetic colleague. It is likely that Frankland's service on the Water Supply Commission led to his appointment to the new Rivers Pollution Commission in April 1868, and that the appointment had more to do with the Treasury's tightness than Frankland's expertise. Shortly after the first Rivers Commission disbanded in January 1868 the Treasury asked William Pole, secretary of the Water Supply Commission, whether the Rivers Commission's laboratory could be used by the Water Supply Commission. Pole was not sure that the laboratory would be appropriate and was instructed to check with his chemist (Frankland). In April 1868 Frankland was chosen for the chemist's spot on the three-member Commission and it may well have been that sharp minds in the Treasury saw a way to avoid supporting duplicate water laboratories by having a single analyst for both commissions. While Frankland's influence on the Water Supply Commission was small—his views were restricted to appendices and to the minutes of his evidence, and the Commissioners neither accepted nor fully comprehended them—his impact on the second Rivers Commission was enormous: he effectively became the Commission. The first (1865) Commission (of Rawlinson as engineer and chairman, Way as chemist, and John Thornhill Harrison as agriculturalist) had been instructed to report on six representative kinds of river pollution: the agricultural and sewage pollutions the Thames received, and the pollutions associated with the Lancashire cotton industry, the Yorkshire woollen industry, the metals trades along the lower Severn, and the mining and metals trades along the Taff in south Wales and along one of the Cornish rivers. In almost two and a half years it had accumulated a mass of ill-ordered information, but completed only two of these investigations. Along with Frankland the new Commissioners appointed in 1868 were Sir William Denison, an ex-army engineer and colonial administrator, and John Chalmers Morton, an agriculturalist and journalist. Denison died in 1870, having collaborated only on the Commission's first report. In the next four years Frankland and Morton published five additional reports: on the ABC patent sewage precipitation process (1870), on pollution by the woollen industry (1872), on pollution in Scotland (1872), on pollution from mining and manufacturing operations (1874), and on the nation's water supply (1874). Morton appears not to have played a strong role in directing the Commission's inquiries or in shaping its conclusions, and we may accept, as did many of Frankland's contemporaries (defenders and critics), that the Commission was for all practical purposes Frankland's mouthpiece. Frankland made clear why no process for determining organic matter could provide useful information about the most harmful contaminants in water and presented the combustion process as the only scientific means of water analysis. Hence regardless of whether he had set out to become a water expert, Frankland had become one. The Rivers Commission appointment was, if not a full time position, certainly a demanding one. It provided Frankland with the means (a salary of £800/year and an additional £700/year for the laboratory) to carry out thorough investigations on all questions of water quality. So superior were the Commission's reports and so closely was Frankland's name linked to them, that he became the leading authority on water questions. health agencies. The Commission's opinions were taken seriously and its recommended effluent standards were widely adopted. The standards were used in law courts to define pollution despite the fact that they had not been included in the 1876 Act and hence had no legal standing. Most important was Frankland's emergence as a spokesman for those seeking to obtain uncontaminated water supplies. The 1870s and 1880s were a period of water reform: towns were buying out private water companies and acquiring new and purer supplies. Often their bills were opposed in Parliament and Frankland regularly appeared as an expert witness to defend such proposals. He was an effective witness: experienced, quick witted, prestigious, in command of a wealth of facts, familiar with continental science, able to explain himself clearly. No previous sanitarian nor any contemporary could match his combination of activism and authority. During these decades Frankland continued his monthly reports on the London water supply. Often he found reason to criticize one or more of the water companies: turbidity, a high PSC or organic nitrogen level, or the presence of 'living and moving organisms.' 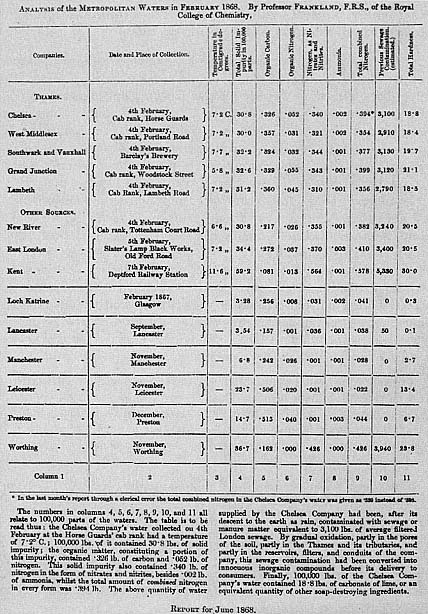 He stopped calculating previous sewage contamination at the end of 1876 but replaced it with a mode of comparing different waters that the companies found equally objectionable: Frankland's 'Table E' showed how many times more impure in terms of organic nitrogen were the waters the river-water companies drew from the Thames or Lea than the water the Kent Company pumped from deep wells. Prior to the development of bacteriological culture methods in the mid 1880s, there were few significant changes in Frankland's approach to measuring water quality. An 1876 paper on 'Some Points in the Analysis of Potable Waters' presented improvements in the combustion process and reiterated the unacceptability of its competitors. An 1880 paper 'On the Spontaneous Oxidation of Organic Matter in Water' was a polemic denying the oxidative self-purification of rivers and an attack on the views of Charles Meymott Tidy, a physician, chemist, and later barrister who was Frankland's principal adversary on water matters. In the last decade of his life, Frankland's opposition to the water companies moderated and he was not a protagonist in the water controversies of the '90s. For two full decades, however, he was at the centre of questions about water quality, and the positions taken by other scientists, and the analytical processes that were developed or discarded, only make sense when Frankland's central role is understood.